If you do not think you will need this phone long term, we also offer the option to rent the Hughes Satellite Phone. For more information and to get a quote, click here. InTouch SmartCards is proud to add this phone to our range of global satellite services. The Thuraya Hughes 7100 is a satellite handheld mobile phone with integrated satellite, GSM and GPS technology. The Thuraya phone offers a wide range of services including voice, data, fax, short messaging and location determination. Thuraya handheld phones opens up a world of roaming. Thuraya enables you to access local GSM networks and link to satellite mode outside of that service area. 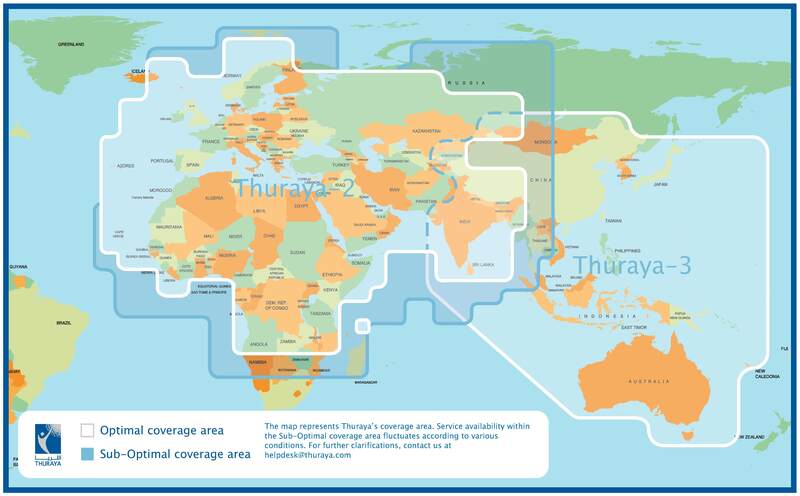 If you are in Thuraya�s coverage area you can make a call to, and receive a call from, anywhere in the world. If you are outside Thuraya�s coverage area you may be able to use Thuraya on GSM mode in areas with compatible standards. Thuraya Postpaid Service costs about $45 a month, and will range from $0.79 to $1.80 a minute. This will vary based on calling locations and called destinations. Thuraya offers postpaid as well as two types of prepaid services: Regular and ValuePlus. Most customers buy the original prepaid SIM/Service for $80 and then the Scratch Cards @ $194 each. They give you $194 of talk time.